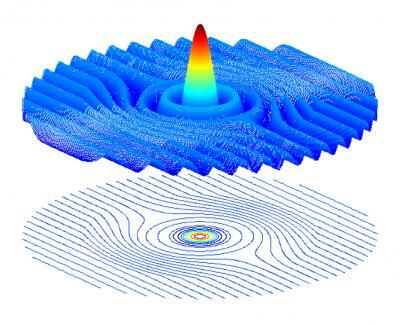 This graphic shows a matter wave hitting a Schrodinger's hat. The wave inside the container is magnified. Outside, the waves wrap as if they had never encountered any obstacle. “From the experimental point of view, I think the most exciting thing is how easy it seems to be to build materials for acoustic cloaking,” Uhlmann said. Wavelengths for microwave, sound and quantum matter waves are longer than light or electromagnetic waves, making it easier to build the materials to cloak objects from observation using these phenomena. “We hope that it’s feasible, but in science you don’t know until you do it,” Uhlmann said. Now that the paper is published, they hope to find collaborators to build a prototype.